The Auburn University Veterinary Teaching Hospital has been ranked No. 1 in the nation among academic veterinary teaching hospitals, according to results from a national benchmarking firm. Dr. Amelia White, right, oversees student veterinarians performing an allergy test on a dog in the Dermatology Service. The independent survey of 26 academic teaching hospitals across the U.S., provided results and rankings for the teaching hospital, a division of the College of Veterinary Medicine. 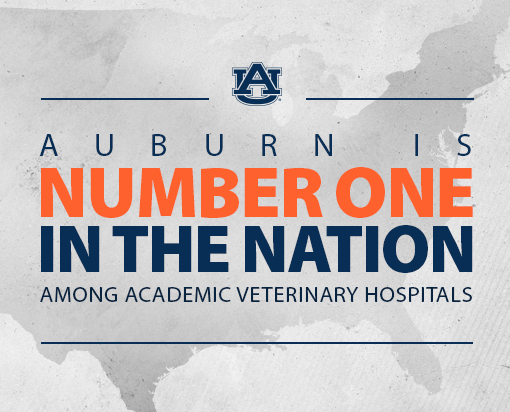 “This top ranking of Auburn’s Veterinary Teaching Hospital reflects our progress toward achieving the goal of being one of the nation’s preeminent veterinary referral centers. Our Veterinary Teaching Hospital faculty, residents, interns and staff are working with great diligence and enthusiasm to provide superior animal health care and excellent service to our referring veterinarians,” Dean Calvin Johnson said. Auburn’s overall hospital rating of 75 percent led the nation’s 26 other academic veterinary teaching hospitals, which averaged 54 percent. Auburn’s performance also exceeded the average rating for 119 private specialty hospitals, which was 67 percent. The survey was sent to the more than 800 primary care veterinarians who refer cases to Auburn’s Veterinary Teaching Hospital. “The relationship between referring veterinarians, clients and the College of Veterinary Medicine is the life-blood of the Auburn University Veterinary Teaching Hospital,” said Dr. Doug Allen, teaching hospital director. Auburn also outscored other academic teaching hospitals in the categories of ability to get a case into a desired specialist and clarity of instructions for follow up. Since completing the first survey, hospital administration and clinical faculty analyzed the results and put into place changes to meet the needs of referring veterinarians. “The most recent data reflects the positive response of those changes,” she said. The annual survey was conducted during the first quarter of 2018. In total, the Veterinary Teaching Hospital treated more than 28,000 animals in 2017 through 22 specialty services in large and small animal veterinary medicine. The Auburn University Veterinary Teaching Hospital provides state-of-the-art veterinary care and serves as a referral hospital and community practice facility to residents throughout Alabama and neighboring states. With board-certified specialists and a nationally renowned faculty, clients of the teaching hospital benefit from the combined expertise of faculty specialists, residents, interns, DVM students and veterinary technicians utilizing a team-based approach to patient health care.